Nothing happens by chance and there's no one better than Cristiano Ronaldo himself to confirm that hard work leads to success. The Portuguese star has come a long way since he started perfecting his football skills and one of his greatest achievements has undoubtedly been the way he revolutionized the game with his trademark "tomahawk" free-kicks (that's how Ronaldo baptized his very own free-kicks). First in Manchester United and later in Real Madrid, CR7 mastered the knuckleball free-kick shooting technique and since 2010 he already more than 15 goals from set-pieces. Even Gareth Bale, the Welsh and still Tottenham's star, has admitted earlier this year that he has been attempting to emulate Cristiano Ronaldo's style when taking free-kicks. Bale: "Everybody knows what Cristiano Ronaldo has done with his free-kicks... A lot of players are trying it these days and thankfully, it started to pay off for me." 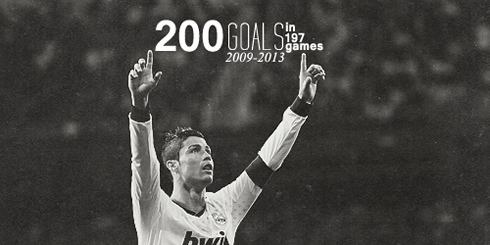 Cristiano Ronaldo is one of the best footballers of our generation. Aged 28, his career has been a glittering success and surely doesn't seem to be close to an end. The Portuguese star, who now plays for Real Madrid, is currently the world's most expensive footballer, having been sold from Manchester United in a world record transfer fee of £80 million. Ronaldo's free kicks have always generated a lot of talk among pundits. A UEFA A licenced coach, we'll be presenting their break down analysis of these feared and deadly free kicks that have wreaked havoc for so many teams. His first goal for Manchester United was with a free kick in a Red Devils' 3-0 win over Portsmouth, way back in November 2003. We all know the look before he steps up, that familiar pose. Hands are by his side, body still, breathing heavy with his eyes set like steel on the target. But what happens next? Here is our six step guide. These six steps show how Ronaldo has mastered the "knuckleball" technique on his free-kicks, ensuring the ball dips due to the top spin. Ensure your standing foot close to and in line with the football. After his deep inhale of breath Ronaldo would have a very deliberate run up to the ball. 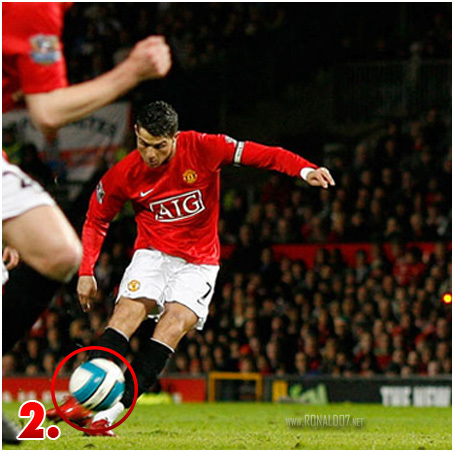 He ensures his standing foot is close to and in line with the ball before striking it. If you are trying to mimic the technique try to place your standing foot as close to the ball as comfortably possible. Hit the ball with clean contact with the instep (the bone from toe to top of the foot). 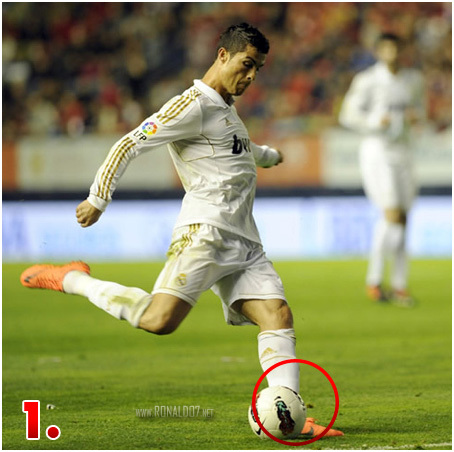 Ronaldo makes clean contact with instep of his boot. He uses. The power that he puts into the strike would generally depend on how far from the goal he is. His explosive power ensures that his right boot flies through the ball sending it towards the goal at high speed. After contact, swivel the striking foot to point towards the goal. Bring the knee towards the chin instead of a normal follow through. This creates the up and down effect (top spin). This is one of the most important aspects of the "knuckleball" technique. The movement of the knee ensures the downspin and dip of the ball. This is the hardest part to master. The standing foot elevates. The kicking foot lands 1st... This generates the power required. Cristiano Ronaldo next game for Real Madrid will be against Espanyol for the Spanish League, on May 11, 2013. You can watch Juventus live stream, Espanyol vs Real Madrid, Atletico Madrid vs Barcelona, Manchester City vs Wigan and Porto vs Benfica, all matches provided from our football stream section.